The house is full. Contemplation is on hold – or held differently! Spaces and places of silence have been sequestered for the season or barred to prevent the new cat from escape. Logistics are about showers and toilets or food; the voices of little people charge the air; familiar reality is reconfigured by necessities. 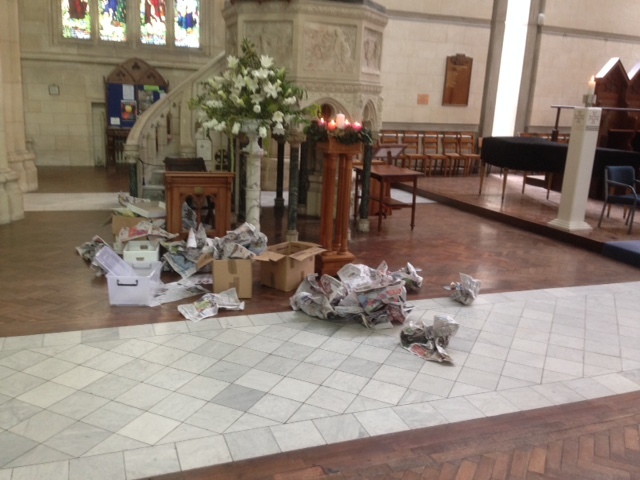 involved the whole congregation and, all decorum abandoned, threw packaging about gloriously – probably the only time the Cathedral approximates something like ‘messy church’. Midnight was as always, special. But there was little sleep as our elderly setter Mac became unwell: I awoke to hear him bark about 3.00am and by the time I had finished attending him, the dawn light was with us. The services of the day ended before noon: on such a warm day many tourists were enjoying the coolness of the Cathedral (a cruise ship was in port) and I was glad to leave George, our DoM, to shut the building once his concert for these seasonal visitors was over. But this Boxing Day I come back to earth. There is a kind of spiritual ‘hangover’ after the ‘mysteries’; certainly some tiredness – just so many services or particular and extraordinary elements to manage, that one is relieved that the celebrations for the great feast have gone so well; mainly this is the tiredness after the adrenaline such events demand. There is something more than tiredness though, something that I might describe as a kind of aching wonder. From being so caught up in the mysteries (and in the mundane busyness that is also part of the mystery) I now have this sense of a journey completed. A spiritual journey of course, but somehow now the ordinary mess and clutter of Christmas junketing, the wails of little people, and the reorientation of all the familiar routines is shot through with a sense of presence, grace and gift. One is tired but grateful.